The Sol Principe / Principito complex has a great variety of things to do. Suits families with kids of all ages, as well as couples and singles. We were half board but had lunch two days and ate out at night. Food varied and was fine, breakfasts were good. Lovely room on 9th floor, very clean with fridge and hairdryer. Excellent views. The hotel is in my opinion in an excellent part of the resort. Lovely beaches and areas for walking. Good big pools to front and back of hotel and a themed area (Flintstones) which appeals to the kiddies. We found the staff nice and contrary to another post I read they all spoke English. Did't really stay in for their night time entertainment but had waterpolo etc through the day. Would certainly use this hotel again without a doubt. We have returned from the Principe Sol today. Been for 10 days with our daughter, son-in-law and 11 month old grandson. 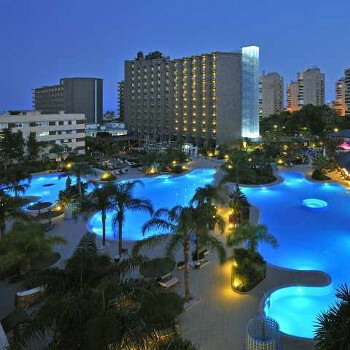 Hotel was brilliant with a lovely pool area, we never had to reserve sun beds no matter what time of day we went to the pool we always managed to get them. We were on the 3rd floor the bedrooms was a little bit on the small size, it didn’t bother us but our daughter had a cot in her room that took up quite a lot of space. Fridge was free and you had to pay for the safe. Hairdryer in the bathroom, air conditioning was great, television but sky news got a bit boring after a week. Food was excellent, but if you went into the dining room at peak in the evening, you could queue for food half way round the dining room, for 15 minutes sometimes. Entertainment was brilliant. My little grandson went baby rock club and he really enjoyed it, been able to crawl about and play with some different toys. We always stayed with him; it was just 1/2 hour freedom for him to have a little crawl. The staff are very friendly. We will be returning back again very soon. We went half board and the food was vety good.Plenty of choice and piping hot. Hotel rooms were lovely and bright and had a hairdyer. Area around pool very dangerous and slippery. Kids pools are fantastic but very little space around them for sunbathing,therefore we felt like sardines.If you arrived down to the pool at 9.15am there was not a sunbed to be got. food is nice in hotel but kiwi bar over the road at the back of apts is the best iv'e eaten in in spain give it a try and you will be back every night. I and my husband have just returned from the hotel Principe we really enjoyed ourselves. The hotel was really nice and very clean. The room was spacious we were on the 10 floor lovely view we did ask for a high floor so were pleased with this. The food was excellent very good choice always hot you could always find something you liked. The pool area was fine plenty of sun beds the only problem was there was not a lot of parasols had to be up early if you wanted a shade. The entertainment seemed ok what we saw of it we went out of the hotel a lot. We did not take children but they seemed to keep the children entertained. the staff were all nice and friendly. We have just spent eight nights in the Sol Principe and cannot fault it. The rooms are large and spotlessly clean, towels changed every and bedding three times during our stay. Breakfast and dinner are very good with a great of dishes at both meals. Heating and aircon and completely refurbished bathrooms. One nice touch is that the lift buttons are Braille coded. For a bottle of house red is a bit steep. The same wine is 2.10 in the Supersol across the road. All in all a very good hotel and will be visiting here again. On arrival at the hotel wasn't quite sure what to expect as building work was been carried out on the hotel but didn't have to worry the hotel was great, the rooms were spacious, my friend and his wife and son were given a double room with 4 beds in and a double balcony they were chuffed to bits. The staff were very helpful nothing too much trouble the food was good but nothing special same food most nights if your kids like pizza thats ok and chips of course. The Hotel has an indoor pool and 2 outdoor to the rear of the hotel there is a fred flintstone themed play area and dinar but this was all closed and opened the day we left also hotel has about 5 shops inside as well as 5 internet terminals and video games to keep the kids occupied. All in all a good hotel for what we paid location a fair way to ewalk to torremolinos but as long as the suns shining whoi cares. We really enjoyed our stay at this hotel. The rooms and lobby area spotless and all rooms have a sea view. The communal areas are large and grand with plenty of places to relax. The pool area at the front of the hotel is quite small and would be very busy in high season. This is mainly for adults and the large pool at the apartments at the back is mainly for children. The food was excellant. Well cooked and plenty of choice. Although as always, alittle boring at the end of the fortnight. There was a huge breakfast choice. The hotel is right on the seafront a good 15 minute walk from the steps and lift which take you to the town centre. It's a nice walk along the wide promenade. The beach across the road from the hotel is shingle and there is a large dip on the way into the sea so it isn't suitable for young children. The beach round the corner at Benalmadena is much nicer. The hotel offers a childrens mini disco from 9 until 10 at night however it was a little disappointing. Some of the staff were alittle impatient and tried to force young children into playing long complicated games which resulting in children being put 'out' and made to sit on a step for long periods (up to twenty minutes)until the games was finished. Adult entertainment began at 10 o'clock and the Shows were excellant. Drinking in the hotel was pricy though. Our only disappointment was the lack of evidence of The Flintstones. We chose this hotel for our young daughter to enjoy meeting the characters etc. However, the characters and childrens activities are only came to the children who spent the day in the kids club all day without their parents. I would recommend this hotel. Fantastic hotel. Nice clean rooms etc pool are nice, we found the staff very helpful, the only thing that spoilt it for us was being mugged outside the hotel near the beach,(I wondered why they had security guards outside the entrance at night). The crime rate in the area is very high and the authorities and hotel no this, having spent over half a day at the local police station along with other tourist who were also a victim of crime. I would never go back to mainland spain...so be on your guard you could be next.